We are a leading Manufacturer of guard room, security guard room and portable security cabins from Jaipur, India. It is fire proof, water proof, thermal insulated , weather resistant etc. Sizes: 1 mtr. x 1 mtr. x 2 mtrs. It can be customized according to customer's requirement and specification. Sizes can be customized according to requirement. Different models & designs available. 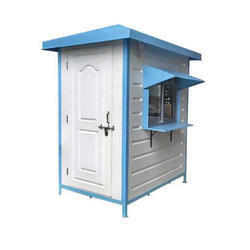 We are the leading manufacturer and supplier of a superior quality range of Portable Security Cabin. The offered portable security cabin is exactly engineered to provide proper ventilation with the help of latest technology. We construct this by using finest material under the observation of experts. Along with that, our honored customers can take this portable security cabin from us in at affordable rates.